Fall is a time to savor all that makes this a treasured season. Even as the weather grows cool, we can’t help but celebrate outdoors, as we enjoy a bounteous harvest and a spooky Halloween. From family-oriented events to seasonal goodies, this year’s fall festivals promise an entertaining blend of festive activities and holiday fun. 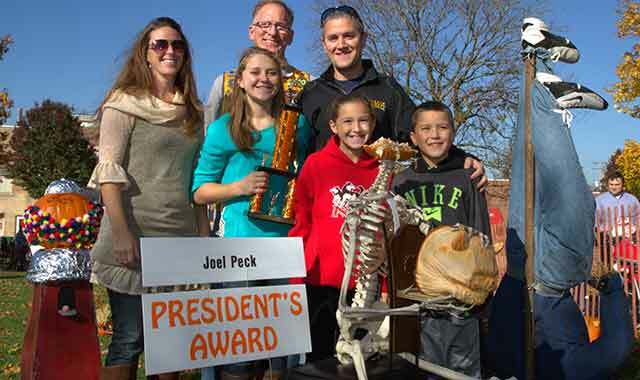 Check out these community classic suburban celebrations before the leaves have fluttered away. Every fall, the streets of downtown St. Charles brighten with falling orange and red foliage and seasonal decorations. 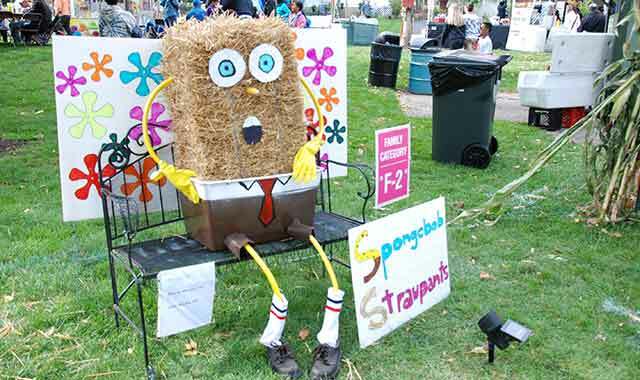 But this Oct. 9-11, Lincoln Park will once again become a field of hundreds of imaginative straw-stuffed faces for the 30th annual Scarecrow Festival. The weekend celebration transforms several blocks downtown into family-friendly hubs for autumn treats, live entertainment, arts and crafts, and more seasonal fun. Of course, the main attraction is the Scarecrow Contest at Lincoln Park and nearby parking lot, says DeAnn Wagner, associate director of the Greater St. Charles Convention and Visitors Bureau. The visitors bureau often receives more than 100 submissions, many created by children and their families. Visitors can stroll through the displays and vote for their favorite, or even make their own at two locations run by the local Boy Scout Troop 60. Along Illinois Route 31, the annual Windy City Amusements Carnival delivers rides and carnival foods. On the river’s east bank, visitors also can check out the petting zoo, some of the numerous food vendors and a new attraction: the Soda Pop Tour, a unique traveling group that serves more than 100 craft soft drinks. Many local nonprofits participate in Scarecrow Fest by purchasing booths, entering the scarecrow contest or providing entertainment for more than 110,000 visitors. The main entertainment stage, located at the municipal lot by City Hall, welcomes several local and Chicago-based bands, including 97Nine and 7th Heaven, as well as local dance academies. For those looking to shop, the Autumn on the Fox Arts & Crafts Show, part of the festival for more than 25 years, showcases nearly 150 vendors near the river in Pottawatomie Park. For a full schedule and festival map, visit scarecrowfest.com. In the quiet countryside between Marengo and Woodstock, homes and farmsteads are separated by rolling fields and long, narrow roads. 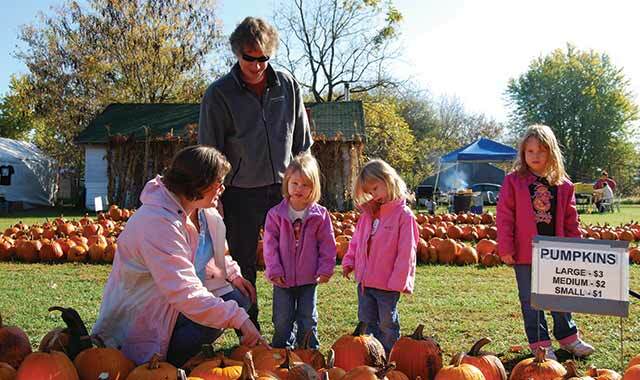 But during the third weekend of October, residents within a 3-mile radius open their barns and studios to visitors – some 12,000 of them – who seek specialty goods, family entertainment, fresh harvests and fall fun. This year, the 28th annual Autumn Drive happens Oct. 16-18. From 9 a.m. to 5 p.m., visitors can hit 23 stops scattered in an area south of Kishwaukee Valley Road, north of Illinois Route 176, east of Deerpass Street and west of Dean Street. A festival map is available online and at every stop. Robert Blue, the festival’s lead organizer, has been participating since the first year with his wife and fellow pottery artist, Susan Galloway, at their home and the Blue Eagle Pottery studio. Participating residents along the drive choose what activities to offer, whether it’s selling specialty goods or hosting activities like pumpkin launchers and corn mazes. Many residents host entertainers or nonprofit groups that promote their causes. At Blue Eagle Pottery, Blue and Galloway host outdoor booths for other crafters and nonprofits, such as the Helping Paws animal shelter and the Woodstock High School Dance Team. The festival puts a spotlight each year on a particular type of vendor; this year’s theme is antiques. Joe and Lois Grasser, the husband-and-wife team behind Autumn Drive’s largest antique vendor, have been refinishing furniture and other antiques for almost 40 years. They’ll be joined on the Drive by six other dealers selling car memorabilia, niche decor, collectibles and more. Autumn Drive was started in 1987 by local watercolor painter Fran Stake. Inspired by neighborhood garage sales, she brought together residents on Garden Valley Road for a neighborhood art studio show and yard sale. Although the festival has evolved since then, its purpose has remained the same. As a nearly 30-year tradition, Autumn Drive has transformed this small part of McHenry County into a community celebration for visitors near and far to enjoy every fall. For more information, visit autumndrive.net. Nearly 18,000 residents enjoy quiet Sycamore, the seat of DeKalb County. But for one week every October, things aren’t so quiet here. What started as a small-town pumpkin-decorating contest 53 years ago has grown into a city-wide celebration that draws visitors from across the Midwest and beyond. Planned this year for Oct. 21-25, the 54th Sycamore Pumpkin Festival includes activities from pumpkin displays and craft shows to carnivals and the annual Sunday parade and 10K footrace. Runners in the timed 6.2-mile Pumpkin Run are encouraged to wear their Halloween costumes while competing. Unlike many other fall festivals, Sycamore’s celebration is operated entirely by nonprofit organizations. “It allows nonprofits, for that one weekend a year, to make some money by providing a service with a guaranteed participation and attendance of 100,000 to 200,000 people,” says Jerry Malmassari, president of this year’s festival committee. The committee designs the festival to be as family-oriented as possible. The wide range of events, spread over five days, allows visitors of any age to find something of interest. There are carnivals just for teens and kids, but most activities allow family members to participate together. About 28 organizations take part in the festival, not including those that only join the parade. Sycamore’s Lions Club, once the sole organizer, returns every year, as well as the Kiwanis Club, local churches, the Sycamore Chamber of Commerce and more. This guarantees that visitors will see the entire town at work. This year’s theme, “Pumpkins in Disguise,” was submitted by Lana Walker, a student at Southeast School in Sycamore. Students always come up with the theme. The festival started in 1956, when resident Wally Thurow, known as “Mr. Pumpkin,” displayed a few jack-o’-lanterns on his front lawn for some Halloween creative fun. The display grew each year, and when Thurow’s efforts were joined by the Sycamore Lions Club in 1962, the official Sycamore Pumpkin Festival was born. Over the decades, the festival has evolved into a town-wide celebration. “After more than 50 years of putting on the festival, we have a formula that works for us, so it’s fairly consistent from year to year,” says Jerome Perez, festival committee secretary. To view the events calendar and a festival map, visit sycamorepumpkinfestival.com. Many fall festivals aim for family fun, but Elgin’s biggest celebration of the season fully embraces the horrors of Halloween. Get ready for a zombie apocalypse during the annual Nightmare on Chicago Street, set this year for the night of Oct. 24, when an entire block downtown is transformed into a makeshift “safe zone” for those escaping the zombie plague. This one-of-a-kind event aims to spook the living – and the undead – for those 17 and over. Nightmare first came out of a brainstorm (no pun intended) in 2011, when the City of Elgin paired with local business Acme Design Inc. to create a unique downtown festival. Now on its fifth celebration, Nightmare draws nearly 15,000 people to Elgin’s Chicago Street, from Douglas Avenue to Villa Court, where a safe zone under “military control” hosts a night of end-of-the-world activities. Starting at 6 p.m., live entertainment is spread across three stages, with acts ranging from ‘90s hip-hop and classic rock to steampunk cabaret and freakshow performances. Svengoolie, host and namesake of MeTV’s B-level horror movie show, returns to this year’s festival for an hourlong meet-and-greet. This year’s event features a few surprises, too – but you’ll have to visit to see what’s in store. Amidst the apocalyptic chaos, Nightmare also hosts live graffiti artists and an Oasis Hookah Lounge. Food and drink vendors will be on the streets, along with 30 vendors and streetside businesses, some of which will stay open late. Tickets can be purchased in advance at several Elgin nonprofits, including the downtown association. While the event takes about 200 volunteers, White says more than 50 come from the downtown association to help execute the doomsday event, which is one of the most profitable for many local businesses. “People come in from all over the country, which is very exciting for such a unique event,” says White. For more information and to view a complete schedule, visit nightmareonchicagostreet.com. This entry was posted on Friday, September 25th, 2015 at 12:00 pm	and is filed under Features, Top Posts. You can follow any responses to this entry through the RSS 2.0 feed. Both comments and pings are currently closed.